Before your first hunting excursion, understanding how to protect yourself and other hunters is imperative. 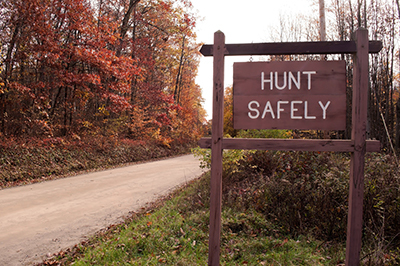 Here are some steps you can take to make your hunting adventures both safe and successful. Hunting is a thrilling and stress-relieving sport when done safely. But fatal accidents can happen when hunters aim and fire at a noise or movement without being 100 percent certain of its source. Before you even point your weapon, identify your target as legal game. Furthermore, look beyond to make sure your bullet won't harm any hunter or hunting dog crouching behind your target. When you have a gun in hand, your priority should be to stay alert and watchful to keep yourself and those around you safe. Even having one drink while you're on the stand can impair your judgment and your aim — and if you encounter an officer or game warden, you could face serious charges for hunting under the influence. These guys are the best..friendly, knowledgeable and always prepared to offer a good deal. The selection of product is outstanding...if you want it ...they probably have it..or will offer to get it for you. I highly recommend you give then a visit..you won't regret it....They buy , sell and trade and are always very fair. Be sure to check out their auctions on Gunbroker..some really cool stuff and they typically start at just a penny..so it is a real auction. Hunters of any age or skill level should use both eye and ear protection when in the field. Guns are known for their thunderous boom, which can damage your hearing over time, and excess powder and spent cartridges can harm your eyes. Unlike other hunter safety tips, this rule is designed specifically for your comfort and security. Adequate protection can prevent hearing loss, sight impairment and other damage caused by your firearm's noises and moving parts. Cartridges may not always fire when you pull the trigger. If your shotgun misfires, for example, use caution. Don't try to remedy the issue right away. Instead, keep your gun aimed at your target for about an extra half-minute in case of a delayed fire. If it still doesn't fire, open the action and unload the firearm carefully. Be sure to dispose of the cartridge safely and make sure your gun's barrel is free of obstructions. While you're hunting, you'll probably have to perform many complex actions like climbing trees or deer stands, crossing fences and jumping ditches. While these movements are a normal part of hunting, you should never do them when carrying a loaded gun. Unload beforehand to complete these tasks safely, and keep your rifle free of ammunition until you're ready to shoot. Hunter education sets the foundation for safe, enjoyable hunting trips. These courses are required before a first-time hunter can receive their hunting license, but they're also valuable in providing essential safety techniques before you step onto the field. You can find online hunter courses or look for a live class near you. Then, put your new knowledge to the test by going to a shooting range or taking a rifle class before your hunting trip to make sure you understand these safety tips fully. Here at The Keystone Armory, we're dedicated to helping you enjoy your firearms safely. Find a variety of new and used rifles, ammunition and gun accessories at our gun store near Erie, PA. We'll be happy to help you find the best products for your needs and teach you essential safety techniques before you hunt. Contact us at 814-734-2750 or stop by our store to learn more.